We all understand the internal restraint of cargo is a vital element of airworthiness, the cargo’s securement is vital to weight and balance. 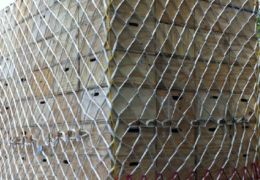 Restraining palletised cargo on military cargo aircraft, our 1-piece pallet net is approved by the US DoD Air Transportability Agency. Another testament to its quality over other pallet nets, such as the 3-piece pallet net, is the recent commission by the Norwegian Defence Logistics Organisation (NDLO), replacing the American Mil Specification 3-piece pallet net. Let’s look at the reasons for our pallet net’s superiority. And when employing a 3-piece pallet net there is far more opportunity for snagging and jamming. Our 1-piece net negates all this, making it easier to restrain an irregular shaped load, and easier reefing of a lower than full height load. Also consider in-field repairs. There is far less moving parts, less metalwork, less to go wrong or break. Our pallet nets are easy and quick to repair, even in theatre where conditions can be far from ideal. NDLO are one of many customers who are delighted with the benefits our cargo pallet net provides. They use it on their C-130 as well as their C-17. It’s also used by operators on their C295, CN235, A400M as well as the Chinook CH-47, and other rotary wing transport aircraft. Make the move to the AmSafe Bridport 1-piece pallet net.